A new boutique hotel has opened its doors today in Manchester’ Northern Quarter, dubbed one of the ‘coolest places to stay’ in the city. Cow Hollow Hotel has been transformed from a former textile warehouse at 57 Newton Street, with an estimated cost of £1.2m in a project headed up by A P Architects. 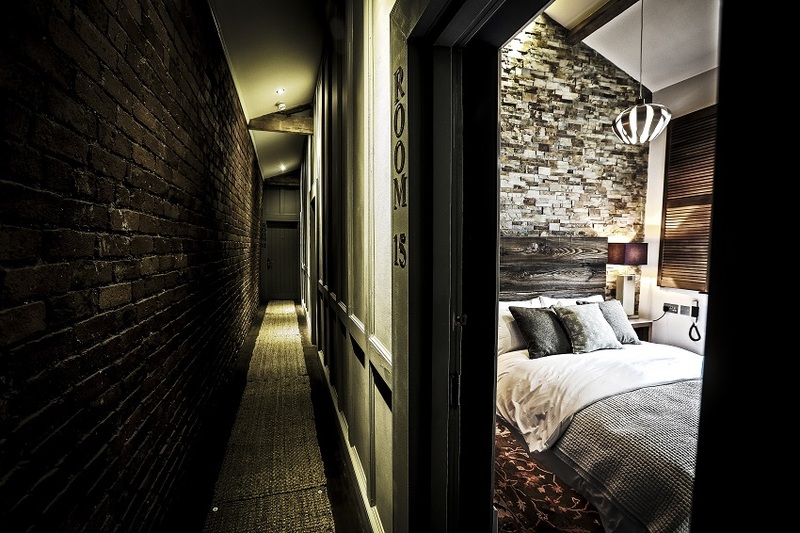 The new 17-bedroom boutique is the brainchild of husband and wife Muj and Amelia Rana, with beds made from railway sleepers, artwork by local designers and WiFi and Netflix available in each room. The venue also has ties with local restaurants, which will be available for guests to call upon for room service delivery and discounts. Breakfasts will be served in ‘gourmet breakfast bags’ in the mornings, while complimentary Prosecco and nibbles will be offered in the evening. On the lower-ground floor of the building is Aviary Café. The name Cow Hollow Hotel came from the Ranas love of the chic neighbourhood in San Francisco and the hotel has been designed to tell the story of the building’s rich history, which was once a key player in Manchester’s ‘Cottonopolis’. Original features have been retained, such as exposed oak beams and Carrara marble fireplaces, plus wrought iron machinery and original factory doors.